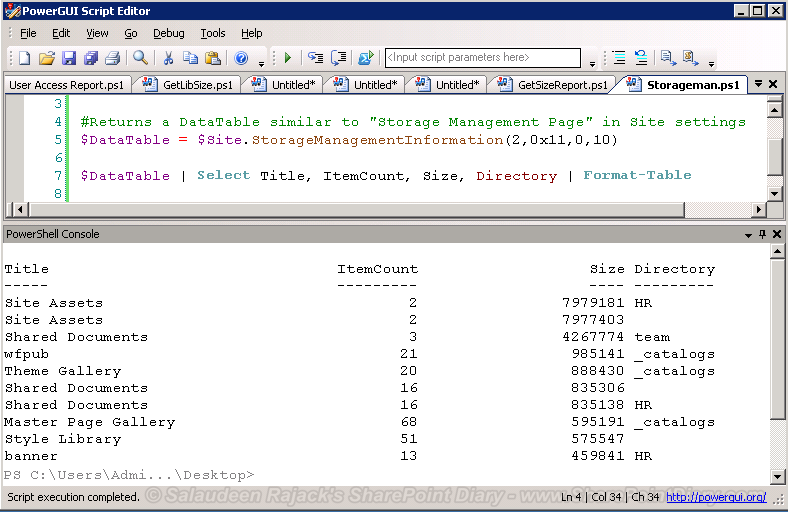 SharePoint 2010 document library sizes can be easily retrieved via Storage metrics: Site Actions >> Site Settings >> Storage Metrics if you have SP1 installed. 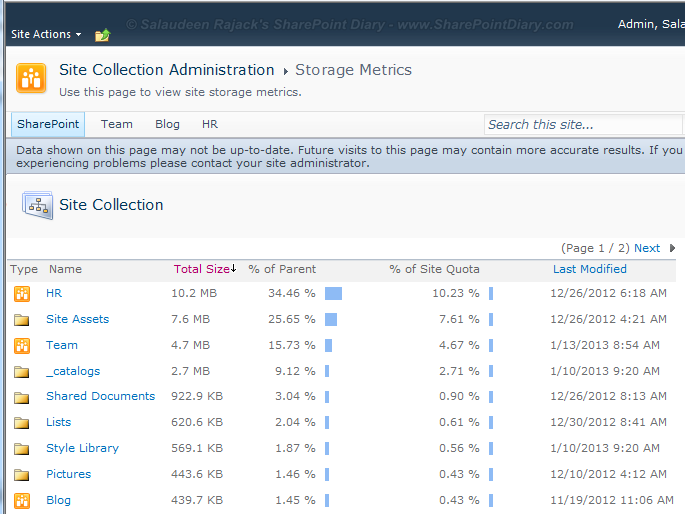 You can get SharePoint library size, ONLY when you have Quotas applied to the site collection. otherwise, you get "The storage space allocation page cannot be used for sites that do not have a storage quota defined." error message in MOSS 2007. How to find a particular document library's size in SharePoint programmatically? Lets see the PowerShell approaches to find SharePoint 2007/SharePoint 2010 document library size, picture library size or for any other libraries. #Loop through the Rows and Fetch the row matching "Shared Documents" in subsite "team"
However MSDN says this API is obsolete. So lets try with an alternate approach. Found this Article in MSDN on getting the storage information through object model. Lets use PowerShell to iterate each folder & sub-folder of a particular document library. This script can be used in MOSS 2007 or SharePoint 2010 get library size. if($SubFolder.Name -ne "Forms") #Leave "Forms" Folder which has List default Aspx Pages. Write-Host "Library Size:" $LibrarySize "MB"
This code is written for SharePoint 2010 and would cause error when you try to run it in MOSS 2007 environment. Say for e.g cmdlet Get-SPSite doesn't exists for MOSS 2007; There is no PowerShell Snap-in available for MOSS 2007, isn't it? Could you please help me in modifying the script to get the library/list size from entire farm and export to excel.